The alternator is very similar to the first version except that it single phase with 8 neodymium magnets (20 mm OD, 5mm thick) and 8 coils. It bolts onto the back of the hub in the same way, allowing the clearances to be adjusted using the nuts on the mounting bolts. 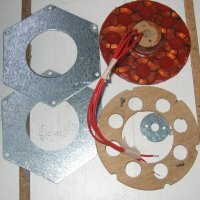 Two rotor plates were the same as the original version except they are made from 2mm galvanised steel with a larger central hole. The magnet spacing was increased to a 45mm radius. 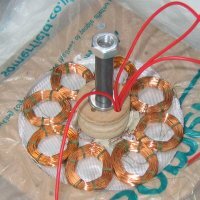 The stator was made of 8 coils each with 90 turns of 24 SWG (0.56mm) wire, the total number of turns being the same as the original 3 phase version. The coils are bound with cotton after winding and the central former remove so they could be squeezed into the available space. The same mould was used to form the stator, but this time I used a top plate screwed down onto the mould to give a smooth face to both sides and compress the glass cloth. 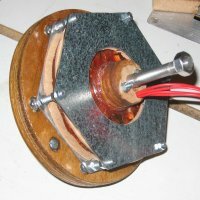 I needed a means of transmitting the torque on the stator to the body of the turbine to stop it spinning on the axle. 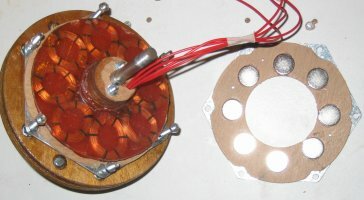 The centre of the stator was built up with a column of plywood disks made with a hole cutter. Two bolts pass through the column and the ends of the bolts engage in holes drilled in the front plate of the turbine body. The column also protects the wires leaving the stator. The 8 coils are divided into two circuits which can be connected in series or parallel externally. Every other coil is soldered together and then the circuit connected to a small battery. All the coils should repel (or attract) the magnet. The tails of larger flexible insulated wire will hopefully be less likely to snap off.